Do you ever feel like you struggle to make your spaces feel cozy? Like they’re ALMOST there…but not quite? Guess what? I’m coming over today to decorate for you. 😉 Ok, maybe not literally, and I’m sure you’re relieved about that. 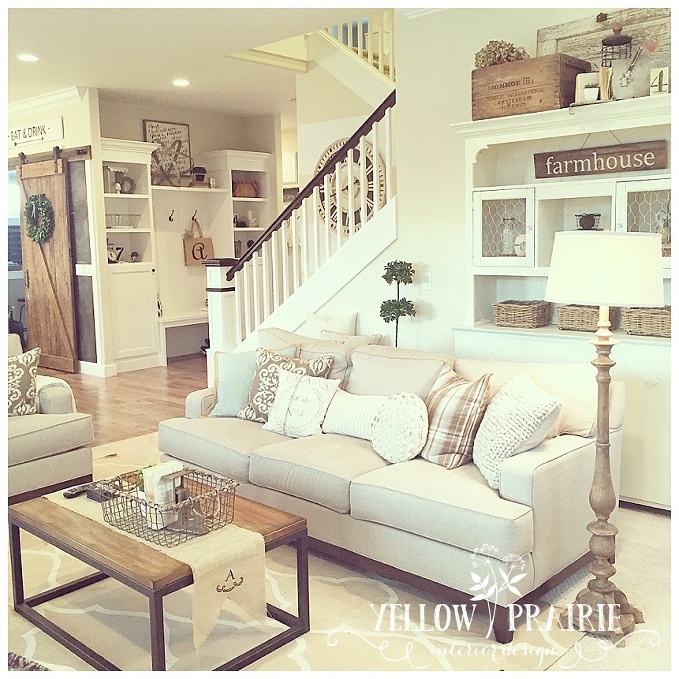 But what if there were 7 (easy to follow) steps to cozy-just right-welcoming-casual-well decorated happiness? That’s what we’re talking about today…so simple, so fun. Aaaand you don’t even need to take notes. Ready? 1. PAINT COLOR. It sets the stage for cozy. This is one of the most-asked questions on the blog, and social media. 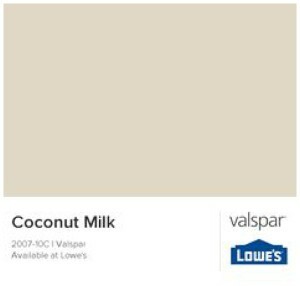 The wall color in our home is Valspar “Coconut Milk.” It’s a great neutral in any room, but it might not be YOUR color. Maybe you’re more into the gray tones. Maybe you like a little darker tone. 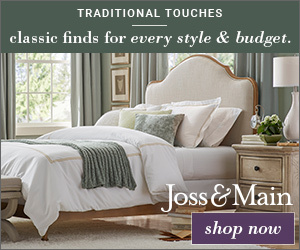 Whatever your preference, start with paint chips…and don’t just look at them in the aisle at the hardware store. Take them home…in YOUR lighting, with YOUR exposure, next to YOUR furniture, flooring, etc. If you think you’ve found just the right one, congrats! Buy a sample of it, and paint it on several walls in your home. The color will look different in each location due to lighting, and it’s better to be safe than sorry. No one wants to repaint a room because they’re unhappy with a snap decision on paint color. Aint nobody got time for that. I already know what you’re gonna say. Your room is carpeted. YES, you CAN put a rug on a rug. I feel like every room should have an area rug. IT’S EVERYTHING! Did you hear that? EVERYTHING. It adds pattern, texture, defines the conversation area, and, back to our purpose today, BRINGS. THE. COZY. I know, I know…you have kids and a dog, and a house-rabbit, and the occasional goat running through. Still. An area rug. Run. Get it now. 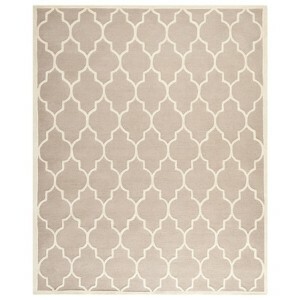 Lest you still need your mind set at ease, we have a very light-colored area rug in our main living space. We have 2 teenagers, the adults in this house are spill-prone (I’m not naming names), and our dog likes to punish us in unspeakable ways that test our rug cleaning abilities (I think you know where I’m going with this). Somehow, the rug still looks great! 3. PULL THE FURNITURE AWAY FROM THE WALLS. Go ahead, walk on the wild side! Oh my goodness. Lighting, lighting, lighting. NOTHING makes a room feel cozier FASTER than some beautiful lamp lighting. 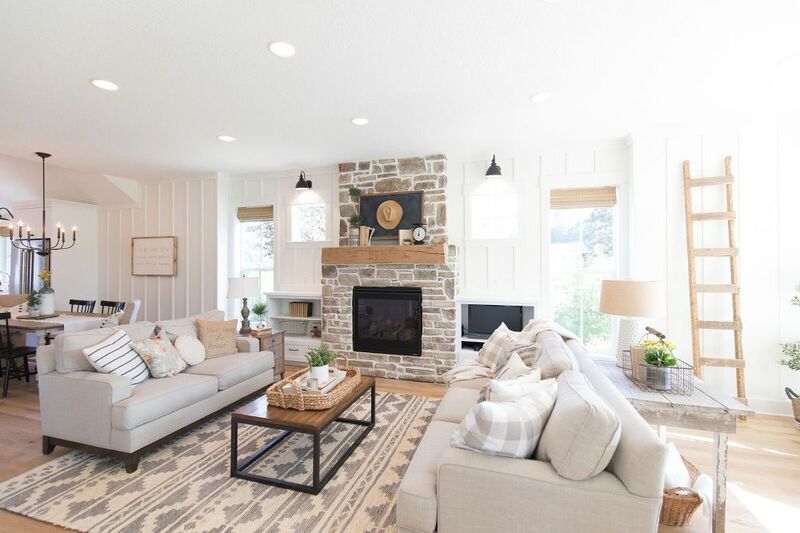 The goal is to have a triangle of light in a room, so maybe you have a lamp on the sofa table, a lamp on an end table, and a floor lamp at the end of the sofa or next to a chair. When purchasing lamps, consider the color of the shades, and keep them similar (when the lamps are turned on you’ll notice the color a lot more, especially if they’re really different). And here’s a fun little tip…you can hide the cords under that new area rug you got! VOILA! Lamps all over the room, and not a cord to be seen. 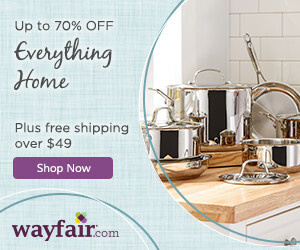 These pretty options are also from Wayfair, find them here, here, and here. Aaaaaand accessories. The finishing touches. This is absolutely the fun part, the frosting on the cake. This is where you can reeeeeally inject your personality into the space. Just keep in mind, a good mix of textures is so important. Some greenery for “life” can lift a room (find this cute faux succulent here), some darling storage options (this cute basket set is timeless AND cute! Find it here), and for all of you farmhouse lovers out there, don’t forget something shiny (find this pretty white artichoke vase here)…this plays well alongside all of the rustic rough textures of the farmhouse look. 7. AUTHENTICITY. Be true to your style. The most important part of the process of feathering your nest. Be true to what you really love. A few years ago, I felt like my style (farm chic) wasn’t really “in” anymore. I felt lost. What do I like if it’s not THAT? I tried to decorate in a way that I felt was “happening” at the moment…but it wasn’t me. It wasn’t even fun because the look didn’t bring me joy! When we built our home, oddly my first instinct was to bring OLD STUFF into the picture. The juxtaposition of the old with the new seemed like the perfect marriage. I got up the guts to tell my hubby that I wanted our old Goodwill hutch to be the crowning glory in the living room. Ya, you know that big old thing we were gonna take BACK to Goodwill? I’m thinking it should be the anchor to our spankin’ new living room. Friends, he went for it. I’m not saying he looked super excited about it, but he went for it. And the rest is farmhouse history. It’s so completely liberating to be yourself. To be surrounded by things that make you happy. Like CRAZY happy. And your friends/family/guests will feel it. And they will LOVE it. Because YOU, my dear, brought the cozy. Jen - I LOVE LOVE LOVE your house. It is just perfect! Thank you for sharing! Hanna Berbres - Hi and thank you for an amazing blog! Kim - Wow – I just discovered your blog and I’m in love. This was just the inspiration I needed to decorate my home. Could you tell me who makes your kitchen cabinets and the door style. I love them! Beautiful home! Would it be possible to share the plans?